Welcome to my lovely home office. . .
My home office makeover is moving slowly but surely. The photo above shows you what I am currently working with. This perfect but unappealing space is our smallest bedroom in our home. And boy, do I have plans to “prettify” this space. 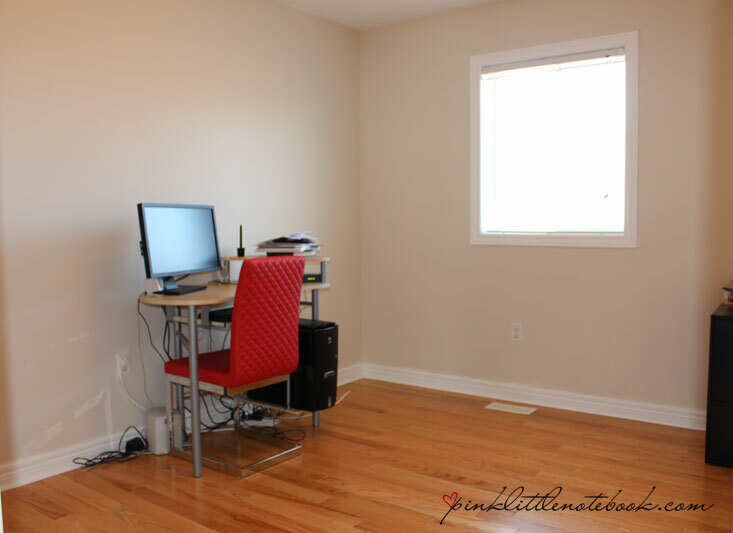 As I mentioned in Part 1: Inspiration for Creating a Home Office, I am looking for a creative space. Something that is feminine but fun. 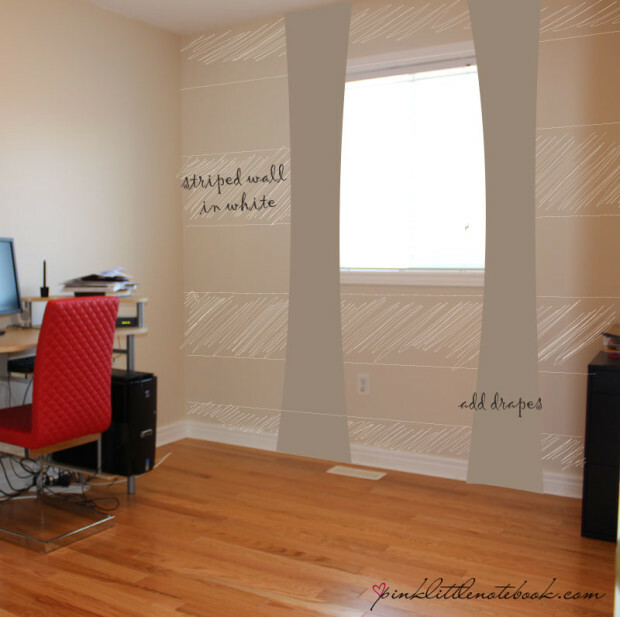 I want the office to feel like a sanctuary, as well as, be a functional work space. That’s right; I want a whole lot of design all nicely packed into this little room. – a big comfortable chair with a great area rug. 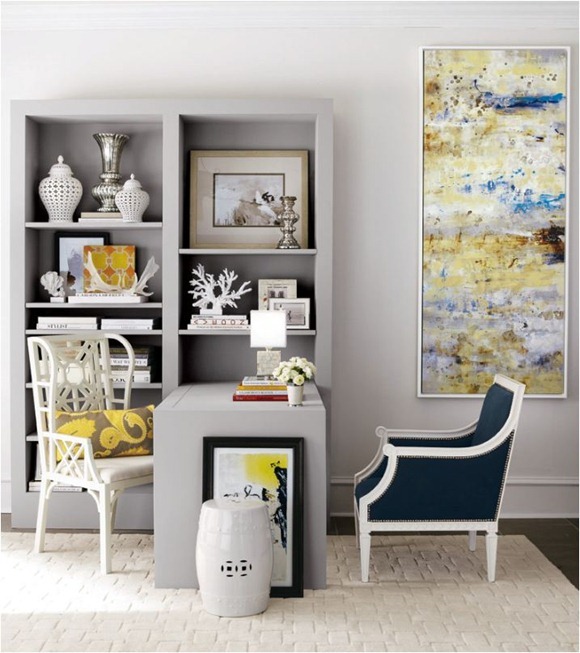 One of the easiest and most efficient ways to create a beautiful space is colour. Especially when you are dealing with something fun like an office or a child’s room. . . go wild! I chose to go with a really “girlie” palette of accent colours. As for the walls, I will keep the colour as is just because it’s already a neutral colour and quite frankly, I have no desire to paint it again 🙂 However, in my must-haves list, I do want a focal wall and what better way to do that than using stripes to attract one’s eye (demonstrated in my picture scribbles). The desk will be placed on the wall that it is currently on now. I have chosen to go with a desk design similar to the below pictures. I would love to do a combination of both these desks. I love the look of the bookshelves and the fact that you can hide all of the computer equipment in it. Yet, you can’t beat all the work space an “L-shaped” desk can give you. This will be a tough one to create and a first for me. I definitely have my work cut out for me. hi you have a great website. I wanna thank you for sharing this interesting information with us. Keep up this good work! love the makeovers, in this last pic there is a pic bar under bottom shelf. what is that called, where to ?